A new shop on Walmart's website will feature more than 125 brands sold at Lord & Taylor, including Vince Camuto and Tommy Bahama. The experience is set to roll out in phases for consumers in the coming weeks. Walmart said it will "regularly" be adding new retail brands and products to its website, as it competes with Amazon to become a dominant player in fashion. Walmart and Hudson's Bay's Lord & Taylor are preparing to roll out a new shopping experience on Walmart.com. Set to launch in phases in the coming weeks, the "store within a store" on Walmart's website will feature more than 125 brands sold at Lord & Taylor, including Tommy Bahama, Vince Camuto and Lucky Brand. The two retailers formally announced the partnership last November. Both companies hope to see a boost in sales from the unique tie-up for different reasons. Walmart is competing with Amazon, which is poised to become the No. 1 apparel retailer in the U.S. later this year. Walmart has also said it aims to grow its selection of clothing beyond everyday, low-priced items, to include more high-end pieces from well-known, designer labels. 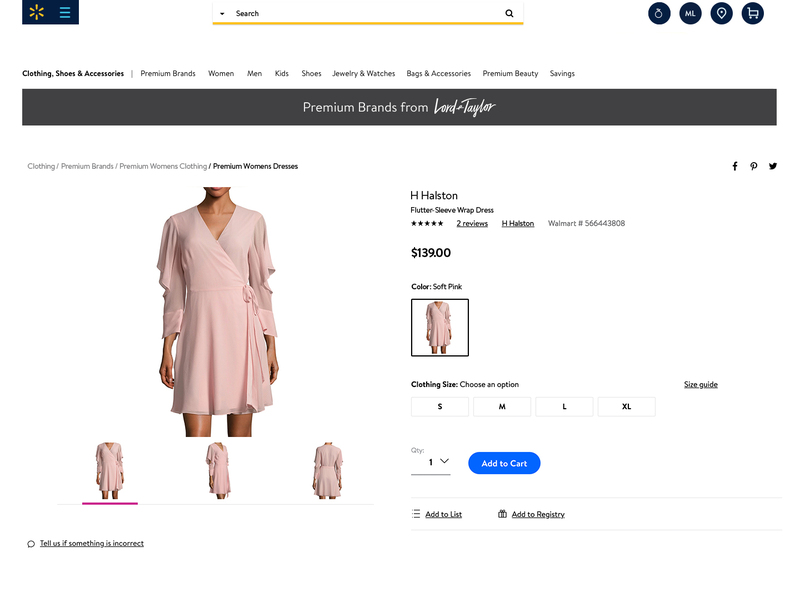 Shoppers are actively browsing Walmart.com today for premium fashion brands, according to Denise Incandela, head of fashion for Walmart's U.S. e-commerce business. But there hasn't been much for them on the platform, up until now. Lord & Taylor, in turn, faces many of the obstacles that U.S. department stores are grappling with today. It needs to cut costs and find ways to win sales from those shoppers who are increasingly ringing up purchases online. The hope is that a new customer base — i.e. Walmart shoppers — will become more familiar with Lord & Taylor over time and shop their stores, too. Most recently, it's been reported that Hudson's Bay is looking for ways to revive Lord & Taylor and "reform the business." The department store chain recently revealed it would be selling its flagship Hudson's Bay department store in downtown Vancouver, as it reshapes other parts of the company. "This relationship is a major milestone for us. ... This is an example of how we are thinking differently and innovating," RJ Cilley, senior vice president of Lord & Taylor's digital division, said about Walmart, speaking on a call with members of the media. Lord & Taylor and Walmart both declined to comment on the revenue structure of their partnership. Incandela told the media that Lord & Taylor's brands won't be available in Walmart stores, only online and on the company's mobile app. A redesigned Walmart.com will soon have two shops — one for everyday brands (including Walmart's newer private labels) and one for premium brands, where Lord & Taylor will be housed. Walmart said this week it will "regularly" be adding new brands and products to the two shops in the coming months.